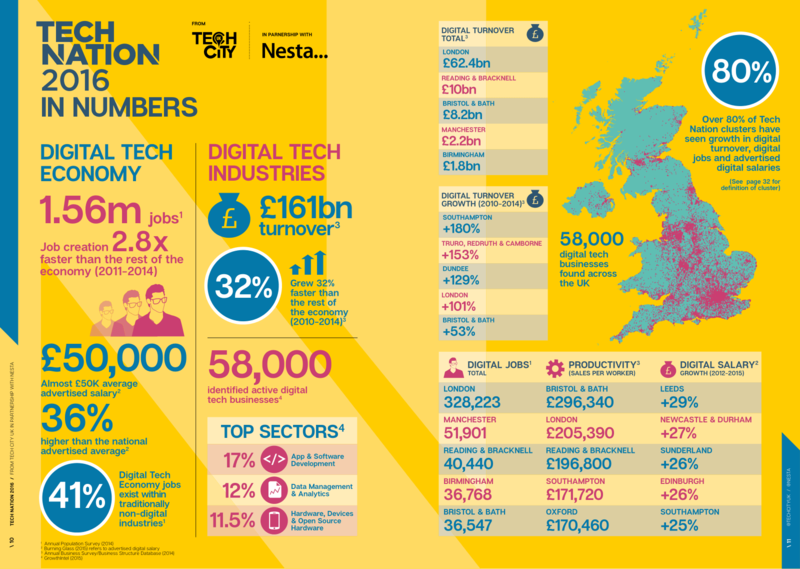 Today marks the launch of Tech Nation 2016, which comes to you from Tech City UK and innovation charity Nesta, supported by core data partner GrowthIntel. Tech Nation 2016 is the most comprehensive analysis of the UK’s Digital Tech Economy to date, showing how the Digital Tech Industries are driving economic growth, employment and regional development. The report was also supported by contributing data partners including AngelList, Burning Glass, Crunchbase, dealroom.co, Frontier Economics, Github, InvestNI, Leeds Data City, and Meetup. With more than 2,000 respondents from digital businesses across the country also contributing insights, the latest iteration of Tech Nation showcases the continued growth and evolution of the UK’s digital tech economy.